Yes it won’t be anywhere near as good as an iPad, yes it looks a bit lame and plastic-y, yes it says “refurbished” on the side, but that doesn’t mean that at under £20 the UK’s cheapest Android tablet isn’t more than capable of getting you on the internet and allowing you to play some of your favourite games on-the-move. The 7″ Scroll from Storage Options is running on Android 4.0, has an 800 X 480 resolution capacitive screen and 4GB of memory. 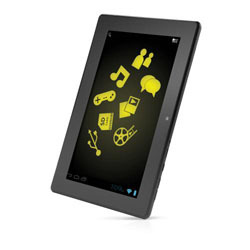 This means it’s a great option for those on a budget who want a simple tablet to carry around and browse the internet with. It’s also ideal for those with kids who are pestering them for a tablet but are reluctant to invest too much in something that’ll either be buried in the garden or thrown from a great height within 24 hours. Although the product is refurbished, it’s guaranteed to have been repaired and cleaned to a standard and does come with a three month warranty to cover your back. Only a select few of the Scrolls are available from Aria for £19.98, so move fast!